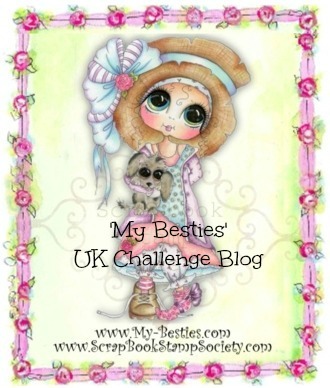 Good morning, time for a new challenge at the Lacy Sunshine Challenge Blog with the fun theme of School Rules For my DT card I'm using Kenna back to school from Lacy Sunshine Stamps. If you visit her online shop you will find a wonderful collection and fabulous variety of Heather Valentin's the (artist and owner) images. Colored with my Copics, Glossy Accents, a little glitter and Stickles with a few gems for sparkle, flower and butterflies die cuts. 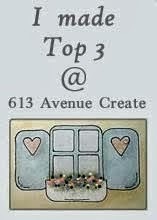 I hope you will come and join us in this challenge sharing your creativity with us. 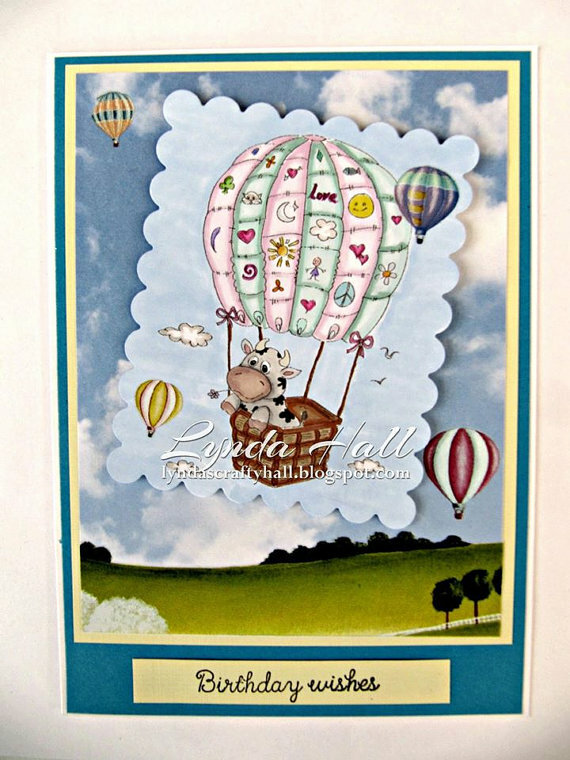 Digital Stamps by Julia Spiri Cow in the Air Balloon. You can print these cute digital stamps to create coloring pages for your party, educational material on paper. 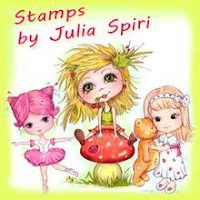 Digital Stamps by Julia Spiri Gothic Witch. You can print these cute digital stamps to create coloring pages for your party, educational material on paper. 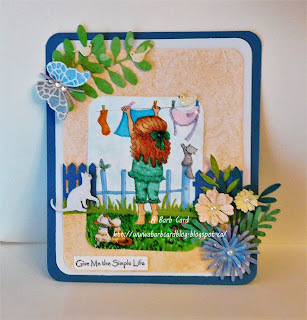 I thought I'd share this card with this adorable image from Julia Spiri's Etsy store, she is called Girl Hanging up Laundry. 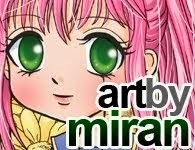 I just happened to see her images on Pinterest and fell in love with them they are so adorable and fun to color. 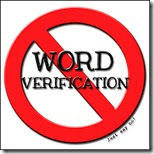 She has a FB group that is a fun place to be with a challenge going till the end of August. 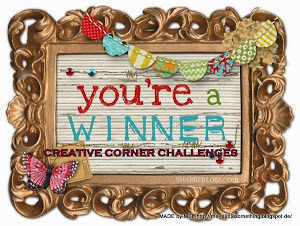 Julia Spiri's challenge blog will have it's first challenge September 3rd, I hope you will come on over and share your creations with us. Colored with Copic markers, the orange background was made using Peach Pearl Sunshine Spray I just love the shimmer it gives. 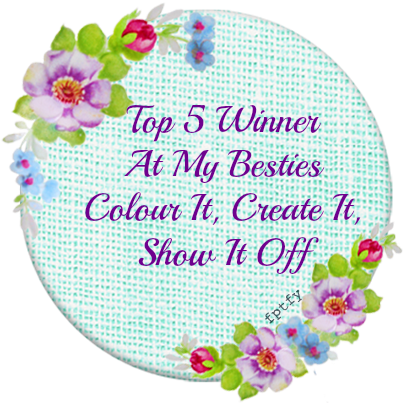 Hello and thanks for stopping by today is the start of a new challenge at Crafting for all Seasons with a fun theme of "You're Having a Laugh. We have a fabulous sponsor for this challenge Dr Digi House of Stamps and he has some wonderful images to at least make you smile and a huge variety too. 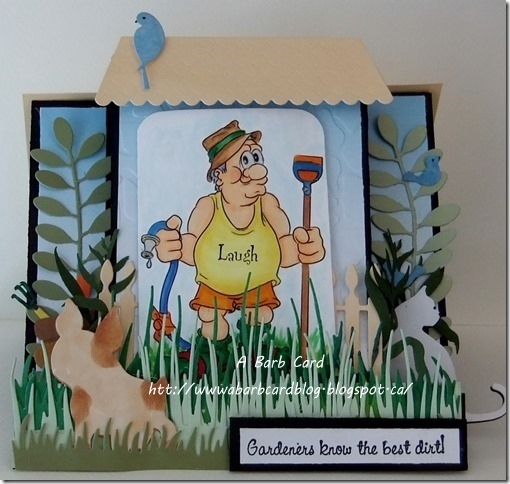 For my inspiration card I'm using Gardening Gus, I just couldn't resist that "charming" face. 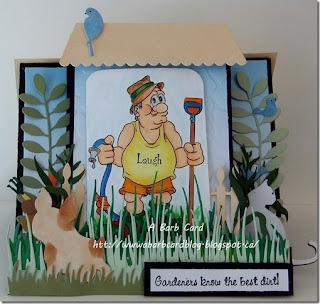 Of course I felt a need to create a garden scene for him to play in. 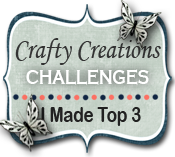 I hope you'll come and join us in this fun challenge and share your creations with us. Colored with Copic markers, using lots of die cuts and punched the 2 pots and garden tools. The Sentiment is an old one from High Hope stamps. The very last thing I did was to take a chance and stamp the word "Laugh" on his chest as all else was done and completed. 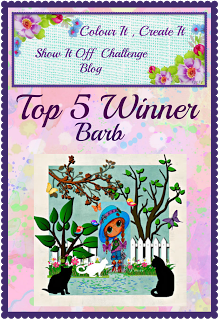 Good morning, time for a new challenge at the Lacy Sunshine Challenge Blog with the fun theme of Weird and Whimsical. 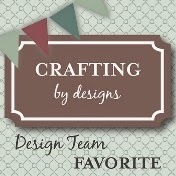 For my DT card I'm using Daphne Emo Girl from the Lacy Sunshine Stamps collection. Colored with my Copics, Glossy Accents, a little glitter and Stickles with a few gems for sparkle, flower and butterflies die cuts and sentiment is from an old Tim Holtz stamp. 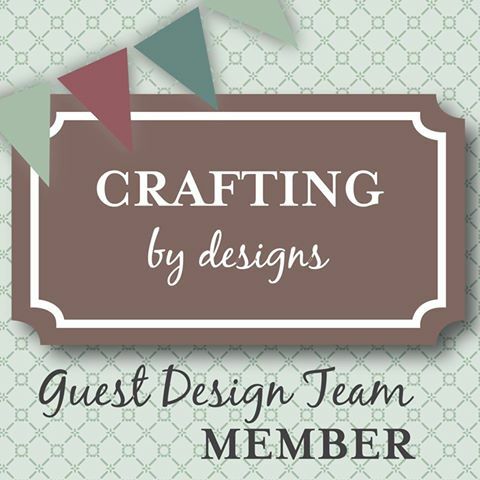 So happy to be here today as a Guest Designer for Crafting By Designs, it was quite the surprise not to mention an honor to be invited. 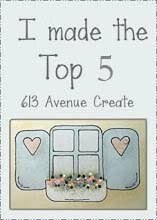 My card had been chosen as one of the Saturday Spotlights from the Summer Fun Blog Hop challenge at Crafting by Designs. Because of that, I was invited by Doris and the DT to be a Guest Designer, of course I accepted and made this Sketchbook Journal. The theme for this challenge is layers, something I seem to do on most of my cards, no specific reason guess I just like layers. 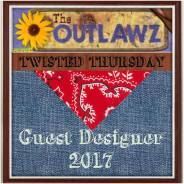 I hope you will come and join in the challenge sharing your creations with us and may want to stop by the Crafting by Designs Facebook page. Here is my little journal I designed to share. 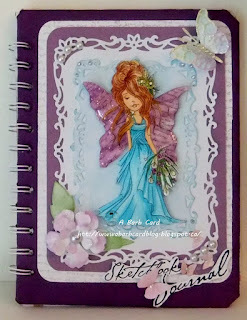 Colored with Copic markers, Glossy Accents added, die cut frame from Sissix, Martha Stewart punched butterflies, flower and large butterfly are die cuts, backing was sponged with Distress ink (blue), I used a script stamp from my stash on the white cs, journal bound with my Cinch. This is a card I was playing with yesterday felt like I was a kid again playing house. This is just one of many adorable digital images by Julia Spiri's at her Etsy store and they are named Naughty Kids. 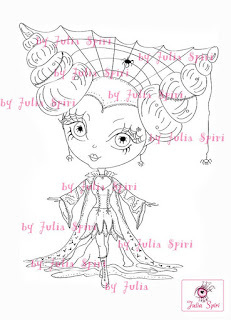 She has a new challenge blog which begins September 3, 2015, the theme will be Anything Goes with a Twist: Something New. I hope you'll come by and join us. 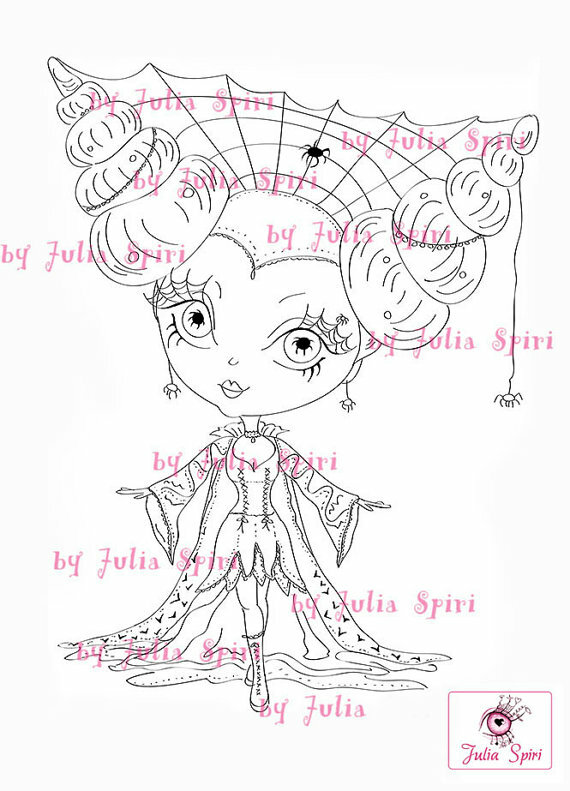 There is also a Julia Spiri Facebook group come and join in the fun and challenge there too. Hello and good morning this is my inspiration card for the new challenge which begins today at Crafting for all Seasons. 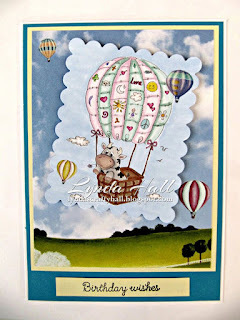 The theme this week is Bright and Beautiful and our wonderful sponsor for this challenge is Bugaboo Stamps. They have a fabulous variety of stamps and lots that will make you smile as well as some very pretty ones. I'm using Pretty Flower Girl who was just too fun to color. 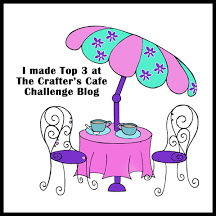 I hope you'll come and join us in this challenge sharing your creations with us. I found a new artist (to me) with some of the most charming digital images in the Etsy Shop Julia Spiri. and she was just too fun to color with my Copic markers and a few touch ups with my Polychromo pencils. 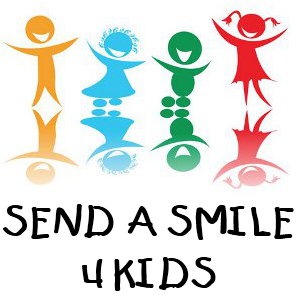 She has a fun Facebook group I think you could come on over and check it out. As well she has a Challenge blog that will begin challenges on September 3, 2015. 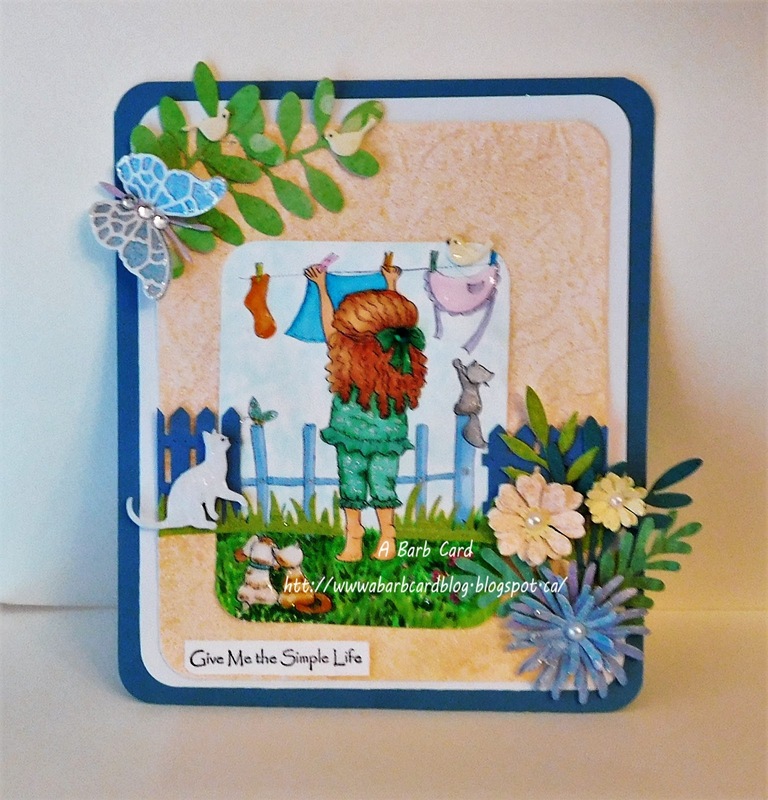 This is a card I made with one of the most darling of images by Julia Spiri, it was love at first sight, who couldn't resist that sweet little face along with so many more. If you would like to take a look at some of her other charming images HERE IS THE LINK and I'm sure you will enjoy your visit. The image I've used here is Girl with Cat, she is one of the newest images and there are so many more to admire. 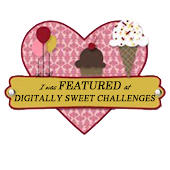 There is a Face Book Group you may like to join and share some of the fun and contests, also on September 3, 2015 the Julia Spiri Challenge Blog will have their first challenge, hope to see you there. This card I made by cutting a 6" by 10", score and fold every 2 inches on the long side, taping the first and last flap together. The lower step is 6" by 5", score and fold every 1 inch, again on the long side taping the flaps together as in the first. I covered with Bugaboo Digital Paper then adhered the 2 together. Next cut a 6" by 6" piece of heavy cs, embossed with cuttlebug and added more design paper adhering to the other 2 pieces. I added and layered my image to more dp, and decorated with various dies placing it on the heavy cs. I hope this make sense if not you can ask me in the comments section. Time for a new challenge at the Lacy Sunshine Challenge Blog and this week the theme is Super Heroes, Is It a Bird or a Plane. 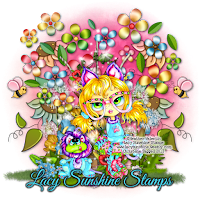 Lacy Sunshine A Crafter's Candy Shoppe is a fabulous online shop offering a large variety of wonderful images, from Cute to Fairies, Etheral Enchantresses and so many more charming characters and a few from the "dark side". I'm using 3 of Lacy Sunshine Super Heroes on my card up front we have Glitter Girl Super Hero, to the right is Peace Power, left is Bows Super Hero and hiding in the back we have Avenging Starr Super Hero. These images are so fun to create with as they all come with the shadow attached to the image in a variety of shapes. 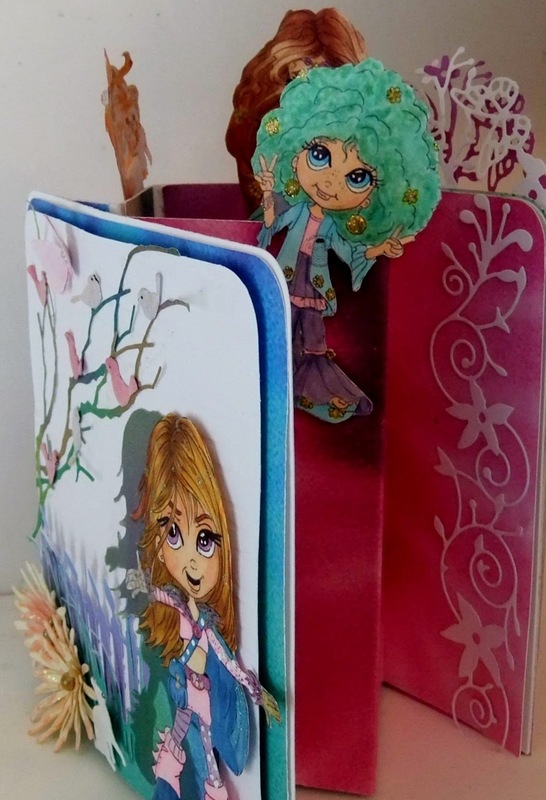 I've also used Lacy Sunshine Tye Dye cs to cover this Accordion card, all are colored with Copic Markers. I hope you will come join us in the challenge sharing your creations with us. 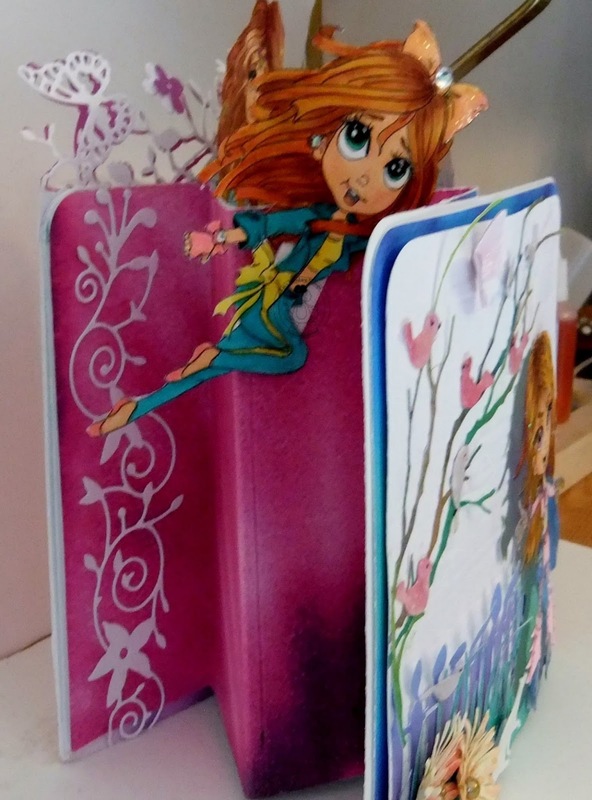 This card is a Concertina Fold Card at SCS with the link to the tut.